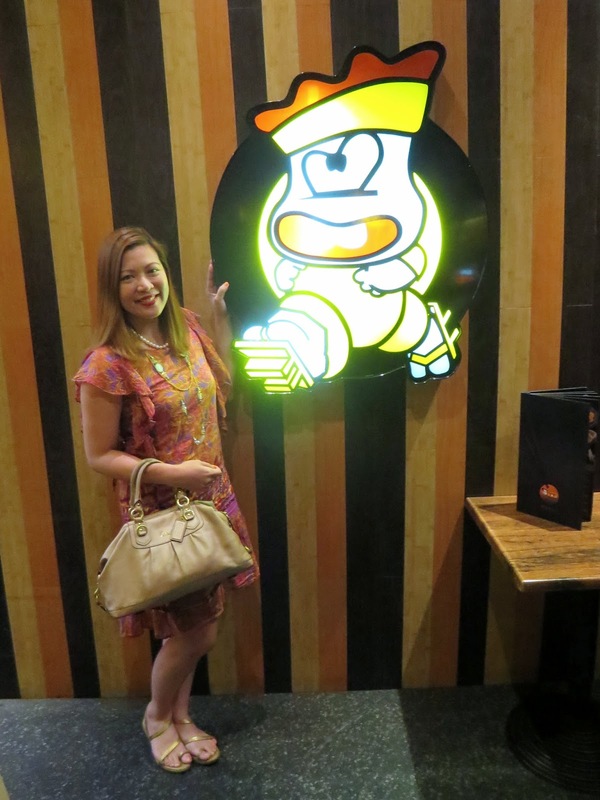 T and I love Teriyaki Boy so we were excited when we got an invitation to try their new dishes. T and I went to Teriyaki Boy in Festival Mall Alabang. Since there are a lot of new dishes added to Teriyaki Boy's menu, we asked our server for his recommendations. For the soup, we tried the Tonjiru (P79/$1.75) which is miso soup but with select vegetables cubed, pork strips, shiitake mushrooms and tofu. This is a different kind of miso soup, something a bit more flavorful. This is not new but I have been craving for Maguro Sashimi (P160/$3.55) which is fresh yellowfin tuna served with fresh daikon, pickled ginger and wasabi. Teriyaki Boy finally has their version of the Dragon Maki (P399/$8.86) which is named because of its shape. 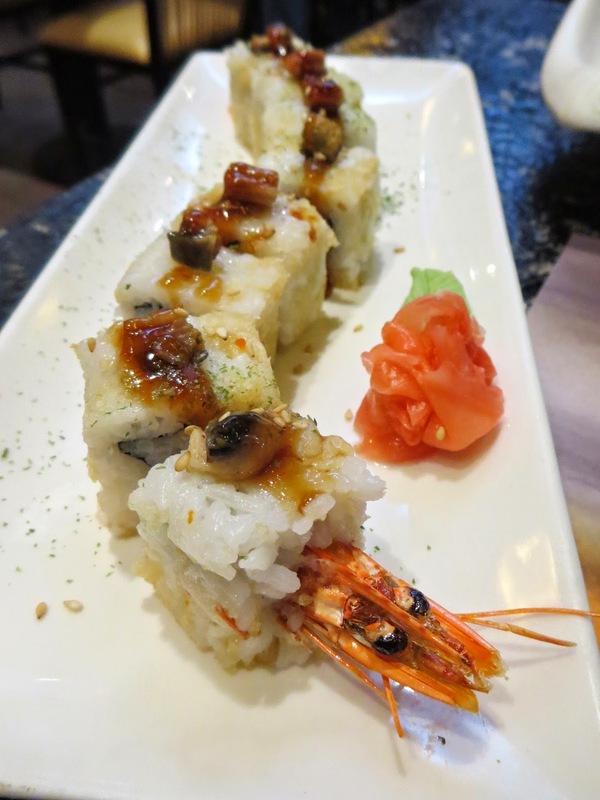 It is a savoury roll of breaded shrimp covered with sushi rice and topped with grilled eel and sprinkled with sesame seeds. According to T, this can be a meal in itself since the shrimp and eel are flavorful plus there's rice already. He really likes this. We also got the Okonomiyaki (P88/$2) which is a Japanese savoury pancake made of special batter recipe, vegetables, squid, and topped with bonito flakes. This is good and we're glad Teriyaki Boy added it to their menu. Teriyaki Boy already had this on their menu before but the Tonkatsu (P222/$5) now is a fillet of high quality US pork and I could really taste the difference. The meat is softer. It's even better than the one I ate in Tonkatsu by Terazawa (read my blog post about Tonkatsu) because this one has no litid! The only thing is the sauce. T and I wish it were a bit thicker, like the ones katsu places have. Our server highly recommends that we try the Beef Tataki (P499/$11) which is Wafu steak, grilled and seared on top of a layer of buttered mushrooms. When asked how we like our beef to be cooked, I answered 'well done' even if he suggested that it be a bit bloody, almost rare. Looking back, I just should've gone with our server's suggestion. When I bit into it expecting a melt-in-your-mouth piece of meat, it was a bit tough. But when I bit into the last piece, which was still a bit rare and red, the meat was soft. So I suggest just sticking to what the chef recommends, don't do what I did. For our dessert, T got the Mango Tempura with Vanilla Ice Cream (P229/$5) which is made up of slices of yellow mango dipped in tempura batter, deep fried with a scoop of vanilla ice cream and drizzled with chocolate syrup. This is a good way to end a meal and is good for sharing for up to 4 persons. Teriyaki Boy also has affordable Rice Bowls (P149), Ramen (P99), and Bento Boxes (P249) available from 10am to 2pm! A lot of new dishes on the menu. Affordable but good Japanese food. T and I will definitely come back to try the rest of the dishes. There are still so many! The beef tataki looks good!